Brighten up your week with an orange theme, a fun color for kids! It is really fun to plan your orange week in the autumn when pumpkins, and orange leaves are plentiful. Discuss with your kids about color names that are also food names, have sliced oranges for snack. 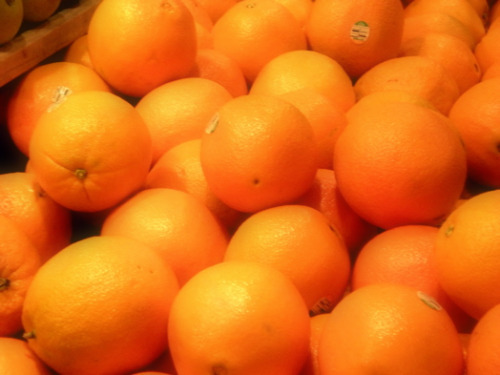 Do an orange scavenger hunt. If you do the orange theme in the autumn, you can carve pumpkins, or do an orange leaf collage. Make an orange collage out of orange craft items, and orange pictures from magazines. Make an orange hand print for your color book. Do an orange watercolor picture. Make orange tie dye shirts. Have an orange meal or snack: oranges, orange juice, carrots, Goldfish crackers, cheese, pumpkin muffins or bread, cantaloupe, butternut squash, orange marmalade on toast, orange yogurt, orange sherbet. Did you like the orange theme? Try more color themes here!